When I think of those I love who are no longer here, I often remember what they cooked for me, or what they liked to eat, or a special restaurant meal we shared. Not what political party they belonged to. Not what religion they followed. Not what they did for a living. No, I immediately glimpse a moment when simple sustenance was a quiet celebration of being alive, and being alive was a sensual sharing that needed no words. My paternal grandmother, Mara Nikitovich, was born in Montenegro. She had worked as a science teacher, but after she married my politician grandfather and had two children, she devoted herself to the domestic arts. When the Communists took over Yugoslavia at the end of World War II, they all managed to escape, first to Paris, then to the United States. My grandparents eventually settled in New Jersey, where a life of struggle awaited. But one thing never changed: food in all its delicious guises held the family together. Baba had hands that could do anything, hands as strong and nimble as mine are weak and clumsy. Knitting. Crocheting. Embroidery. Gardening. She could do it all, but she never scolded me for failing at them and not really caring. Of course, Baba was also an excellent cook. Even when she came home after a grueling day crocheting silk ribbon dresses in a New York City sweat shop, she somehow found the energy to prepare djuvec, a chicken and rice casserole, or passoulj, a white bean and pork stew, or sarma, cabbage stuffed with meat and rice. I watched as she put cabbage leaves in a barrel of brine in the basement so she would have them all winter, made jam out of plums, rose petals or sour cherries, and cultivated her own yogurt, sour cream and caymac, a cross between butter, yogurt and cheese that required layers of cheesecloth and infinite patience. My Baba made rich Eastern European meals every night, and after each one, my grandfather would kiss her hand and tell her it was the best meal he had ever had. I inherited her ability to cook in all ways but one: the art of baking. (Okay, I don’t make jam or yogurt either, and you will not find a barrel of brined cabbage in my basement…) She made her own filo dough, stretching it across the kitchen table before cutting it into thin sheets. I was mesmerized. Brioche, bread, meringues, jam-filled butter cookies. It seemed there was always something baking in her kitchen. When I think of her, the scent of butter and vanilla fills me with warmth. But it is my Baba’s cakes I remember best. Watching her create them while I sat with my book at the kitchen table was like observing an artist at work. These were not simple two-layer American-style cakes. No, they were masterpieces, with six or eight or more layers, each layer smothered in butter cream, crowned by caramel or chocolate or coffee glazes. In addition to nine or ten egg yolks, the batter might call for finely ground almonds or walnuts, with no food processor to help grind or mix or whip. When Baba said beat the eggs and sugar until light, she meant for half an hour by hand until the mixture was almost white. She would sometimes split the cooked cake layers evenly by deftly pulling a thin string through them in one quick sweep, a maneuver that to me seemed worthy of a surgeon. I don’t have much of a sweet tooth, especially not for cake, but Baba’s cakes were the exception. One in particular was so complicated, and so delicious, and so very beautiful that some day, maybe, I might try to make it, even though I lack the patient, rule-obeying temperament such a feat requires. This Empress of Cakes is called “Rosa Torta” because of its rose-pink glaze. Just remembering biting into a piece makes my mouth water. My sister and my cousin, my mother and my Aunt, all mastered it (or so they claim). Even my dad has made it (or so he claims). Somewhere out there is a brave reader who will succeed and, I hope, send me a picture, a story, and, if at all possible, a small piece. Here is the recipe for Rosa Torta, courtesy of my cousin Vesna in Holland and edited a bit for language. I am sure there are other versions out there, but if the cake is not pink, it cannot be the Empress. With a mixer, whisk together the eggs and sugar. Add the butter and whisk until incorporated. Add 500g of flour, baking soda and milk and whisk until the batter just comes together. Put aside the mixer and work in 100g of flour with your hands. The dough will be sticky and should just come together. Do not knead it as you would bread dough or punch it down. This dough needs gentle handling. Now place the dough on a work surface and sprinkle it with the remaining 100g of flour or less. Use the palms of your hands to stick the flour to the surface of the dough and fold it in. The dough should stay soft and a bit sticky but should form one compact mass. Do not add too much flour or the layers will be hard. Weigh the dough – it should be about 160g – and divide it into 7 pieces by forming it into a log shape and cutting it into discs. Cut out 8 rectangles of baking paper, 24x30cm. . The dough will be sticky and should be that way. First just place one disc on the paper and press it with your hands into a small rectangle. Then roll out each disc so it covers the entire surface of the paper. If the rolling pin does not stick to the dough, you have used too much flour. Sprinkle just enough flour on the dough so you can roll it to fit the paper. Cut off extra pieces and stick them to places where the dough was not enough. Keep rolling, cutting, and sticking on pieces. When you are done with one layer place it paper-side down on a baking pan. With a fork make around 50 pricks on the surface of the layer so that bubbles will not form during baking. Have two baking pans ready so you can rotate them, and never put a layer on a hot pan. Put one pan in the lower middle half of a preheated oven at 160°C (320°F and no fan!) for 6 minutes. Bake one layer at a time, and stack the cooled layers with the paper one on top of the other, covered with a kitchen towel, while you make the filling. Pour hot milk over ground walnuts so you get a nice, thick, creamy paste. You might need a little more milk depending on how dry the walnuts are. Whisk the butter and add it to the walnuts. Whisk some more. Beat the egg whites into stiff peaks, and then slowly add in the sugars. Fold the egg whites gently by hand into the walnut cream. Divide the walnut filling into 7 equal parts. Take a serving tray and place the first layer on it, removing the paper. Warm a cup of milk and sprinkle the layer with drops of milk. Not too much, or it will be soggy. Cover the layer with filling, then place the next layer over it. Repeat the process. Cover the last layer, smooth side up, with paper and put a tray over it. Now comes the trick. Place something heavy over the entire torte and place the torte like this in the fridge for 12 hours or more so it evens out. Take the torta out of the fridge 3 hours before placing the glaze on it. Whisk the egg whites into stiff peaks. Set 2-3 tablespoons aside for later. Add half the sugar, the lemon juice, the sunflower oil and the food coloring and mix well. If the mixture is too dry, add in the reserved egg whites. 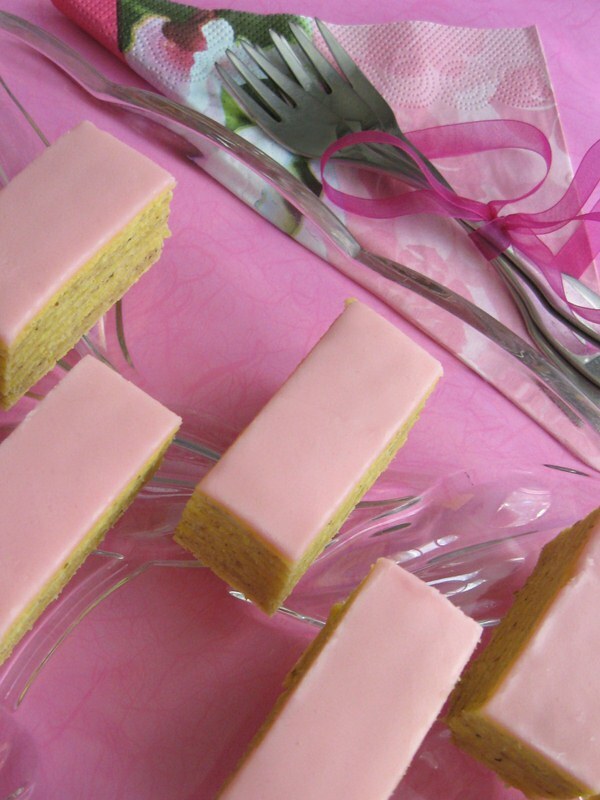 Using a long and wide knife that you have run under hot tap water spread the pink glaze over the top layer of the cake. You will probably have some icing left over, but that’s better than not having enough. Place the torta in the refrigerator for 2 or 3 hours or until the next day before serving. Cut off the uneven sides before carefully cutting the cake on a 45-degree angle into small rectangles. With a smile masking your fatigue, serve perfectly cut pieces of Rosa Torta to your coterie of friends and admirers and hope that they realize what an amazing person you are. When they finally leave, praising you effusively, of course, take a long hot bath, have a glass of wine, then fall, satiated and exhausted, into a soft bed and dream of an all-inclusive tropical resort where sun and service rule the day. Or, if you have not been fazed at all (I hate you! ), try your hand at Dobos Torta or Walnut and Coffee Torta or Raspberry Torta. After the Empress, those will seem like a piece of cake. You leave my mouth watering! Sounds a bit like the Princess cake that Kelly makes at Kelly’s bakery…I am in awe of those who have the skill and patience to bake (to me it almost requires a degree in chemistry & physics) and I remember that my grandmother, Violet Lee Baker (no pun intended), was a queen in the kitchen as well. What I would give to find her Pineapple Upside Down cake recipe!